In pharmaceutical sector SMEs are recognized as a major driving force of innovation in Europe. Based on an Open innovation Model, SMEs need to validate in clinics (Phase I/II) their technologies before they can transfer them to the Big Pharma. Preclinical and clinical phase I are financed in a 50-60% by venture capital funds, and this constrains this companies to limited budget and time for this validation. In this Open innovation Model, SMEs need to validate in clinics their technologies in a cost effective way. This statement will be only possible if technology developers can easily validate their manufacturing processes and can scale them up for the production of small size batches according to regulation requirements. This is something extremely difficult in some cases due to the lack of specialized pilot plants for custom manufacturing of small batches suitable for first-stage clinical trials, even more so when sterile conditions are required. NanoPilot has received funding from the European Union Framework programme for Research and Innovation H2020. 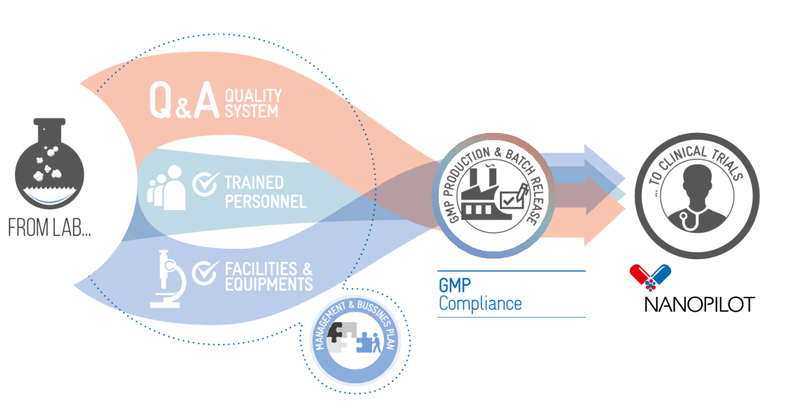 The objective of this four-year long project is to set-up a pilot plant operating under Good Manufacturing Practice (GMP) for the production of polymer-based nanopharmaceuticals. The pilot plant will accelerate the development of nanomedicine, currently in its infancy within the pharmaceutical sector. A short interfering RNA (siRNA) nanoformulation for the topical treatment of ocular pain associated with dry eye syndrome (DES), hyaluronan-based spheres for the treatment for interstitial cystitis/painful bladder syndrome (IC/PBS), and a HIV nanovaccine. pre-clinical and clinical trials. State of the art production processes, including continuous-flow reactors and highly advanced characterization techniques, will ensure the quality of your nanodrug. 4 Research groups, 3 SMEs and 2 industries have joined forces in NanoPilot. Nine partners that have significant track record in knowledge creation and innovation in their respective domains to guaranteed the success of the proposed project.